Many countries find it difficult to maintain the ability to cook. Wood is scarce or expensive and takes a long time to gather. 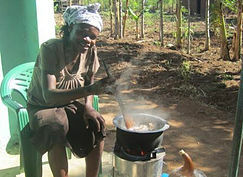 In addition the stoves are often the cause of many health issues. You can help change that by getting involved and supporting our initiatives. We are working with experts from around the world to implement proven technology and techniques and in addition local communities benefit because we are maximizing the work done in each country. The systems that we are using are proven in Africa and this page will be expanding to bring you pictures and information on each project. 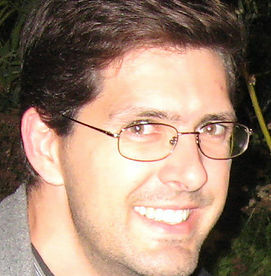 Salim Mayeki Shaban - Pictured above. 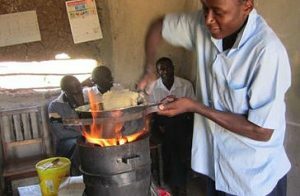 We are proud to be working with Mr. Shaban to bring his biochar stove to Africa, Nepal, Ghana, Zambia, and Democratic Republic Congo. years. 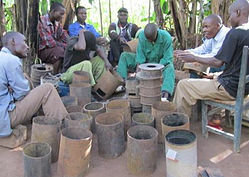 12,000 farmers trained on the use of biochar and each setting up biochar demonstration plots, 8,000 pyrolytic stoves sold over the past four years and a current capacity to produce about 900 stoves per month (completely on a grass roots level having been trained by Dr. Paul Anderson), ramping up production capacity for fuel briquettes made from Water Hyacinth off of Lake Victoria (targeting about 10 tonnes of production per month), production of 2.5 tonnes of rich biochar enhanced organic fertilizer from chicken litter, water hyacinth extract, and human urine additives. We have reviewed the economics of each of these activities and find each of them to be quite sustainable and profitable for ACON. 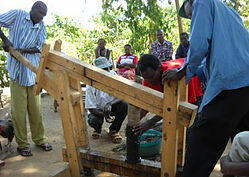 ACON is now assessing the use of microfinance to scale their activities up to reach more of the community. 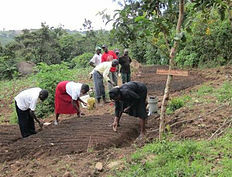 In addition ACON supports orphanages and widows in the community." renewable energy, sustainable land use, soil and nature conservation, good community design, and the renaturalization of our towns and cities. Taiwan, Japan and Nepal and the creation of a Biochar educational centre in Toronto. All are examples of his many efforts and attempts at achieving some measure of sustainability both within his community and around the world. 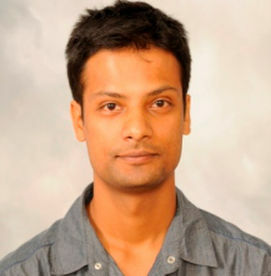 Alok is a mechanical engineer with an extensive research and academic background on renewable energy, mostly bioenergy. He is a technology developer and an entrepreneur too. He played a key role in developing a torrefaction technology for Greenfield Research Inc., Halifax, NS as a co-inventor, where he worked on the patent application, and research and development starting from design to performance test of bench to pilot scale units. He also worked to design multiple 100+ MW coal fired fluidized bed power plants. Before coming to Canada, he established a successful company in Nepal called Energy for Development-Nepal in 2009 as a founding president and since then he is constantly working towards developing bioenergy sector with cooperation from various industries in Nepal. He has also worked in rural energy policy and is motivated towards developing solutions for ailing economy of Nepal. 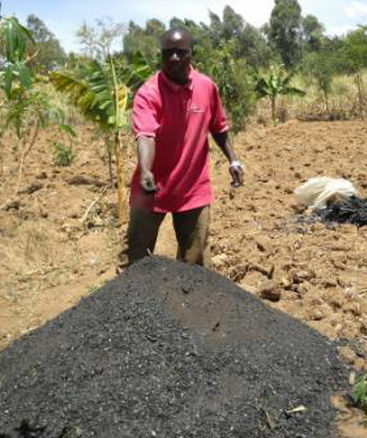 In his current Job as Coordinator for Alberta Biochar Initiative in Lakeland College, AB; he takes pride in being a part of the concerted effort by regional and international organizations to commercialize biochar for the global benefit.